The word “liturgy” finds its origin in the Greek “leitourgia”--root word “leit”—which is a public work done on behalf of people, or on behalf of someone else. Liturgy, then, is necessarily an ordered activity that comes to us from our heritage and tradition. As a divine action, primarily, it draws us more and more fully into the mystery of Christ and forms us into an icon of Christ. Christian liturgy is unique in that it is rooted in history, and not in some mythical space. However, the liturgy does not seek a return to the past but moves us to the “Eschatos”—who is Christ, the final person, in whom we will be all in all. In the liturgy, Christ’s own Paschal Mystery, a real event of history, is made uniquely present in the “now” because he destroyed death and all that he accomplished and is, is now part of the divine eternity and so transcends all time. What was begun with the Apostles is handed on through the sacrifice and sacraments around which the whole liturgical life of the Church revolves. By the power of the Holy Spirit the Apostles entrusted their mission to others. Apostolic Succession then is itself sacramental and structures the whole life of the Church. To accomplish so great a salvific work, Christ is always present to his Church especially in her liturgical celebrations. 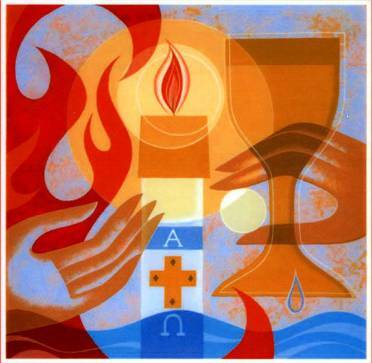 For a wonderful reflection on the liturgy see The Catechism of the Catholic Church nos. 1066-1162.